The richness of colour and texture in the Grand Storey at Houghton is such that even on a second or third visit it is easy to overlook the careful orchestration of the decoration. It is only when one is lucky enough to get to know the house quite well that the sense of the build-up towards the climax of the state rooms becomes fully apparent. Then one can appreciate the carving and gilding and how pattern and texture play their part in the complete composition of the house. Sir Robert Walpole, however, was careful not to let posterity know what it all cost. Philip Yorke, who went to Houghton in 1750, recorded that “the late Lord Orford owed to Lord Coke, as he informed us, about £200,000, and would not say how much more, declaring he had burnt the bills”. So, in the process of destroying almost all the evidence, he denied us a real understanding of how it was achieved, of how Kent slotted in with Campbell, and of the role of furniture-makers and upholsterers alongside painters, carvers and plasterers in creating an ensemble. Fig 1. Sir Robert Walpole’s Bedchamber in 1920. In 1745 it had a bed with painted taffeta hangings. Houghton appears such a complete statement of one mind at one time that it is not easy to get behind that appearance, but the story of the creation of its setting (to be described later in the year) suggests that it was the result of developing ideas. Certainly Campbell’s designs, as published in Vitruvius Britannicus III in 1725, do not represent the final form of the house, and Sir Robert was not a convinced Palladian. Clearly Kent’s involvement in the decoration represented a change of direction; and as a result of the discovery of two designs, for the saloon (illustrated by John Harris in Furniture History, 1985), it has become apparent that he was involved, or about to be so, in 1725, a year before the first lated drawing for the chimneypiece and overmantel in the Stone Hall. Moreover, as was pointed out in that article, they are the earliest known drawings for an architecturally designed interior in England. It was Kent, not Campbell, who introduced rich, painted decoration of a type probably developed at Wanstead and Cannons and still to be seen at Mereworth, and who developed a more painterly approach to decoration. At Houghton he introduced not only a new style but fresh craftsmen headed by Rysbrack, with whom he had previously worked at Kensington Palace. Fig 2. 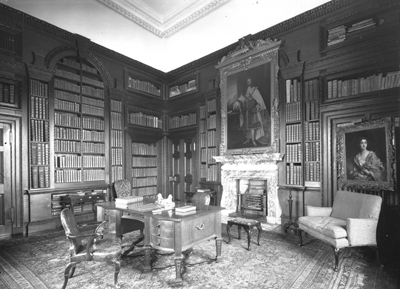 Sir Robert’s Study or Library in 1920. It is lined with mahogany. The Grand Storey divides into three sections, with the hall and the saloon in the centre, the great apartments to the north and the family rooms to the south. There was no architectural gilding or decorative painting in the south rooms, and although the doors and doorcases are all of mahogany, like those in the state rooms, the mouldings of the doors are not carved or gilded. That distinction was carried through into the furnishing, with the only gilt furniture being pier tables and frames to the glasses and in the Gibbonsesque carving brought from the old house, originally round the overmantel in the Family Drawing Room and now in the Family Parlour. Fig 3. The Saloon about 1900. This shows one of the set of big pictures by Cipriani hung in the room after the sale of Sir Robert’s collection to Catherine the Great. Adjoining it was his closet, and at the south-east corner of the house was the study (Fig 2), which gives it a more private sound than library, the term used in 1792 and ever since. It had two tables with drawers, one of which corresponds with “an excellent mahogany writing table with 14 drawers green cloth top and leather cover” listed in 1792 and still standing there. Its companion is presumably the uncarved black writing table now in the room below. As well as a mahogany oval table and 11 chairs, there were two telescopes and a reading screen; and in 1792 there were six walnut-tree chairs and two elbow chairs in blue damask. Next to it on the east front is the Common Parlour or dining room, a room with painted panelling and a Jonesian ceiling. In 1745 that that had six tables in it, 24 chairs, a pier glass, a large chandelier and 27 pictures with festoons of peartree carving saved from the old house. Among the pictures was one of Mr Locke by Kneller, which was one of those sold to Catherine the Great, sold again from the Hermitage in the mid 19th century and bought back by Lord and Lady Cholmondeley some 25 years ago. Fig 4. The pattern of the caffoy in the Saloon. It was supplied by Thomas Roberts, probably in January 1729/30. Again and again at Houghton the number of chairs listed in parlours and bedrooms comes as a surprise, and that explains the enormous numbers for everyday use quite apart from the famous sets in the rooms of parade. Indeed, one of the unique pleasures of Houghton is the secondary furniture, chairs with elegant lines and well-proportioned mahogany tables with drawers. On the other hand it is virtually impossible to sort out the placing of the sets, because only two of Thomas Roberts’s furnishing bills survive, and they show that Sir Robert was furnishing other houses at the same time as Houghton. However, they include many references to supplying walnut chairs and settees. The other rooms on the south front formed the third of the principal apartments, with its own ante-room off the great staircase, the Blue Dressing Room, a closet and the Blue Damask Bedchamber at the south-west corner of the house. That had a bed with blue hangings and blue case curtains, and there were also a table, two stands, a looking glass, an India cabinet, an inlaid cabinet, a settee, 10 chairs and a stool. The three pictures included the full-length of Sir Robert in Garter robes, now in the Marble Parlour. In 1792 Horace Walpole crossed out the reference to its being Sir Robert’s Bedchamber and wrote “Family”. Next to the Blue Damask Bedchamber on the west front was the drawing room, “hung with yellow caffoy” and with a ceiling copied from that in the dining room of the old house but with Sir Robert’s Garter star inserted in the centre. It had a marble table and a large pier glass, both still there, a couch and three pillows, two settees, 12 chairs, a card table, a bust over the chimneypiece, 15 pictures and a brass chandelier with eight branches. The pictures included eight Van Dycks from Lord Wharton’s collection, bought in 1725. In 1792 the room had 12 walnut-tree chairs with yellow caffoy and pink tammy cases, and it was called the Rose Coloured Drawing Room after the silk hangings. Presumably the caffoy hangings were in a poor state after the pictures were taken down, and so the walls had to be rehung, but, money being short, only loose covers were made for the old chairs. Those chairs and the couch could well be the furniture now in the library, although the material has in the interim faded from yellow to old gold (Fig 10). Fig 5. Back of a chair in the Saloon. 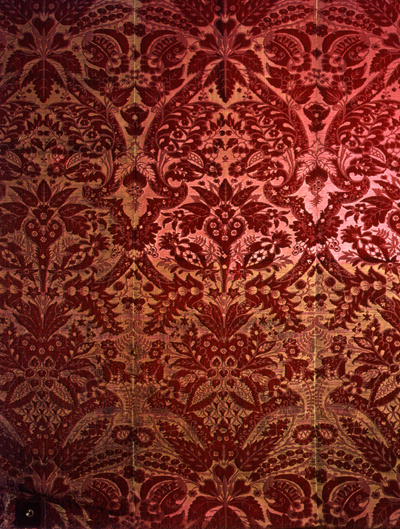 Possibly a unique survival of the fashion for reflecting an elaborate pattern in stamped moreen or harateen on the backs of seat furniture. He continued: “The roomes at the right hand of the salon will be almost in the same manner, and as this is designed for two apartments of state, will be rather finer.” The hall was already finished and it was lit by a lantern with 18 branches for 18 candles. Soon after Sir Robert’s death that was sold to Lord Chesterfield, and the 2nd Earl bought the present gilt chandelier at the sale in 1748 of the contents of the London house of his spendthrift brother-in-law, the 3rd Earl of Cholmondeley. There were two large marble tables with one bust, one copper vase, and one copper figure on each (presumably all bronzes), four terms at the corners with bustos on each and two terms with bustos in the niches. In 1792 there was a Turkey carpet 30ft by 18ft on the floor, but the 1745 inventory makes no comments on the carpets in the rooms, only giving a list at the end. However, a Mr Wenyeare(? ), who wrote an account of a visit made towards the end of Sir Robert’s life, which survives in manuscript form, having been given to Lord Cholmondeley in 1932, said that he was struck by “how richly cover’d are the floors in the whole house with fine Turkey or Persian carpets not leaving room for a foot to step beside”. Fig 6. One of the Saloon chairs. They were probably designed by Kent to take the pattern of caffoy and made in the house by James Richards. The saloon was evidently finished by May 1731, when John Loveday went to Houghton, and the apartments to the north were sufficiently far advanced to be used when the Duke of Lorraine was entertained at the end of that year. Sir Thomas Robinson, who was also there in 1131, mentions “the ceilings in the modern taste by Italians, painted by Mr Kent and finely gilt; the furniture of the richest tapestry etc; the pictures hung on Genoa velvet and damask; this one article is the price of a good house, for in one drawing room there are to the value of 3000.” The cost is exaggerated, but Robinson’s description can be compared with Wenyeare’s, who says the room was “filled with ye finest Painting all in rich gold frames and so close to one another that we could see but little of ye hangings behind which were all of Genoa Damask, or figured velvets”. As in other houses of that time, there was a progression of patterns and materials, with the boldest in the saloon. That is now generally called Genoa cut velvet, while the Aedes described it as crimson flower’d velvet and Loveday as caffoy in 1731; and that, happily, is confirmed in Thomas Roberts’s bill “For 164 yds of fine crimson caffoy for the Sallon at Houghton at 14s 6d per yard £118-18-0”. The account is undated. but it is after April 1729, and probably runs up to this last payment on January 29, 1729/30. It is a bold design with a 4ft 6in repeat; there are three complete repeats on the wall (Fig 4). The 1745 inventory lists three marble tablets, with two terms each, two settees, 12 chairs, four stools, two tea tables with cups and saucers, two festoons by the chimney with four branches each. As was pointed out in the “Treasure Houses of Britain” catalogue, “the perfect balance between the lines of the chairs and the bold pattern of the damask suggests that Kent must have designed the one to suit the other” (Fig 6). The payment for the chaffy suggests that it came first, and it could be that the furniture was carved at Houghton by James Richards, whose name constantly recurs in the accounts. Fig 7. 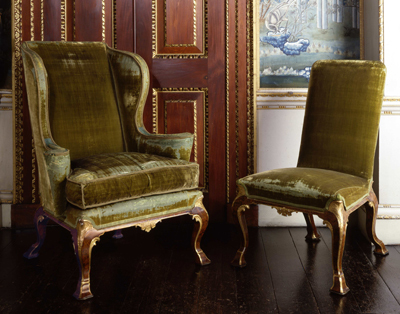 Parcel gilt walnut chairs from the set in the Wrought Bedchamber and Cabinet in more original green velvet. The pattern of the caffoy is echoed in the stamped moreen or harateen used on the backs of chairs and settees (Fig 5), the only time I have come across that refinement on a set of English chairs. Such elaborately patterned woollen materials still in use must be very rare. Judging by practices in other houses of the time, Sir Robert might have been expected to continue the crimson note into the drawing room, but going from caffoy to a finer velvet of the kind found at Holkham. However, instead he chose plain green silk velvet. 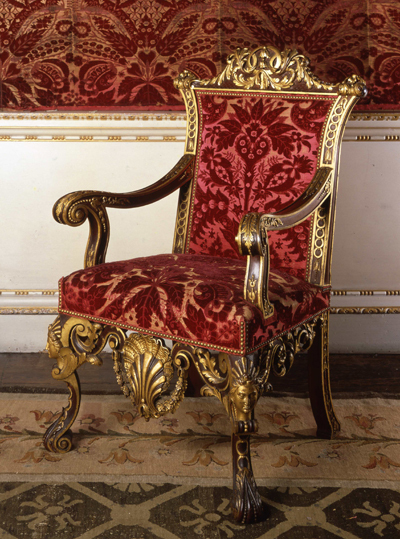 It is a particularly beautiful colour, but even so it would be fascinating to know exactly when and why he chose it, because velvet was known to be an impractical material for upholstery, as Lady Burlington reminded her husband. Unfortunately, only the estimate of the length of velvet required for the drawing room, bedchamber and dressing room survives, with a note of Roberts’s name on the outside, which suggests that he may have supplied it, but there is no mention of cost or date. Altogether 521 3/4yd was needed, and it probably cost about 32s a yard. Lord Hervey, writing in July 1731, says that the rooms were not yet finished, but “The furniture is to be green velvet and tapestry”. Green is the colour of Venus and sleep, and since Venus provided the theme for the tapestries and the painted decoration of the state bedroom, it clearly relates to that idea. But that may not have been the first idea for the room, because when the Duke of Lorraine stayed at Houghton the green velvet bed was not yet finished – presumably then as now one had to wait for the trimmings makers – and he slept in the needlework bed, which is a much grander version of those mentioned last week and was completed after Sir Robert was given his Garter in 1726. Fig 8. 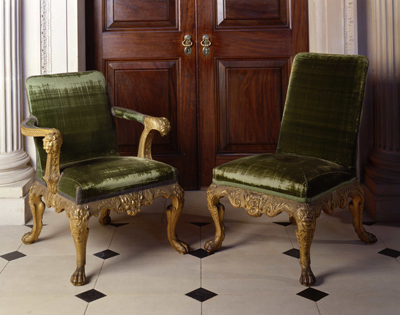 Carved and gilded chairs upholstered in original green velvet. Provided for the Drawing Room and State Bedroom. Work was still going on in 1732, for in May, 12 great brushes and six gilding tools arrived, in August £1 12s 6d was paid to Mr Cooper for leaf gold for Mr Kent, and there were many payments to John Jones, the painter, who is recorded by Croft-Murray as having worked under Thornhill in 1722 and with Kent on the White House at Kew in the 1730s. Presumably he was the ornament painter working under Kent’s direction. But to return to the drawing room, in 1745 that contained two settees, 12 chairs and four stools, a brass chandelier with eight branches and four large silver sconces with two branches each and 27 pictures. After the pictures were sold, the walls were rehung with green striped hangings, which were more up-to-date. They remained until the Prince Regent gave the 4th Earl of Cholmondeley the present white silk hangings, which did away with the need for major pictures in the room. However, the original furniture, with carved and gilded frames, all survives up to the present day (Fig 8). Originally there were no curtains, but both in the bedroom and the dressing room there were curtains of green velvet and the bed had case curtains of green silk, the rod for them still appearing in the 1921 COUNTRY LIFE photographs. The bed, which was probably upholstered at Houghton by Roberts, was completed in 1732, as can be seen from the account for £1,219 3s lid for the trimmings supplied by Turner, Hill and Pitter, which is one of the few to survive. There were 11 chairs in the bedroom and 10 in the dressing room, and the bedroom had an India chest, presumably the one still there, an India cabinet and screen. In the dressing room were an India cabinet, a glass-topped table (now in the saloon) and a silver filigree cabinet, which is also probably identifiable in the house. It is interesting to find that carved wood was not thought suitable for case furniture in such spectacular rooms. The tapestries in the dressing room that gave it its name, the Van Dyck Dressing Room, are recorded by J. H. Plumb as having been acquired by Sir Robert’s father. Fig 9. A carved and gilded chair in green damask. Shown here in the Marble Parlour, for which the set was originally supplied. That dressing room is separated from the Cov’d or Wrought Bedchamber by a lower ante-room without any enrichment, which enabled servants to move in and out without being seen, and in the bedroom is the bed in which the Duke of Lorraine slept. Here in 1745 there were eight chairs, a table, two stands, an India chest and a looking glass. The 1792 inventory confirms that the chairs consisted of one easy chair and six chamber chairs with walnut-tree and gilt frames and covers of rich green velvet. The case curtains to the bed and the window curtains were of green silk. The style of the chairs looks more like 1715-20 than 1730-35, and so perhaps they were the best set from the previous house that Sir Robert recovered. At the corner of the house was the Cabinet, where Sir Robert hung 51 of his smaller pictures. That, too, was very fully furnished with a table, two settees and 15 chairs; and in 1792 there were still 12 walnut-tree chairs stuffed and covered with green velvet and a pair of settees (Fig 7). 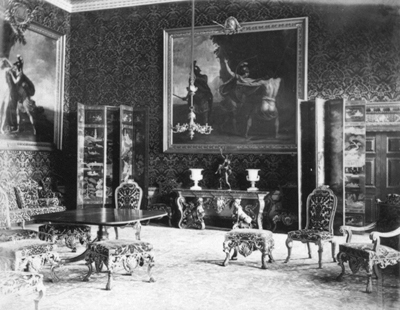 By that time they had blue tammy case covers, and that raises the possibility that the blue ground Chinese paper was hung soon after the sale of the pictures rather than by the 4th Earl of Cholmondeley, because one would expect the colour of the chairs to relate to the hangings of the room rather than contrast with them. 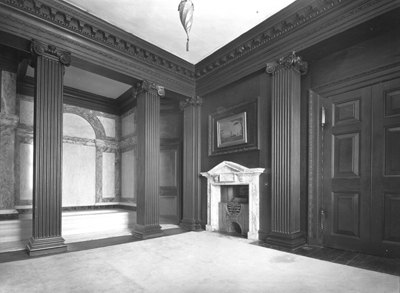 The final room of the Grand Storey is the Marble Parlour, which was completed after the end of 1733 when the present chimneypiece and overmantel were set up. 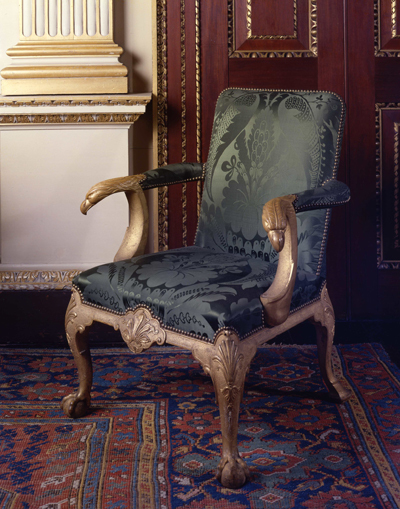 Here, when the two inventories are put together, the green idea is found to continue: in 1745 there was a settee and 12 armchairs, and in 1792 they are described as “12 elbow chairs stuffed & covered with green silk damask, carved & gilt frames & serge cases”. 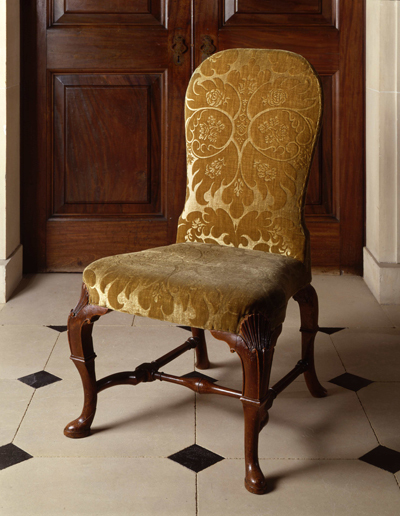 The room now contains a spectacular set of chairs with carved and gilt gesso frames with a C monogram and cut velvet upholstery, but they were not made as dining chairs and they must be later arrivals at Houghton. 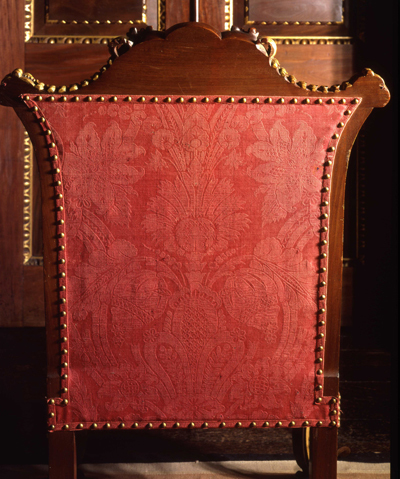 It has been suggested that the C might stand for Chandos, but could they not be chairs made for the 3rd Earl of Cholmondeley and have been bought at the 1748 sale? Fig 10. Walnut chair upholstered in caffoy. Part of a set now in the library that may have been originally in the Family Drawing Room. What must be the original gilt chairs survive at Houghton (Fig 9). They have eagle head arms, being an elaboration of a mahogany set in the Family Parlour. Those in use have been covered in green damask of the Amberley pattern that follows the material on those in store and could well be original. It is typical of the thought that Sir Robert put into Houghton that he should keep the colour running on, only choosing a smooth as opposed to a pile fabric for an eating room but still impressing visitors by using damask rather than a more hardwearing material, as was usually done. However, he or his advisers had a nice sense of when to be extravagant and when careful, and if one looks closely at the gilding of the mouldings, it runs out below the dado level and although the skirting moulding is the richest in the house, it is picked out in ochre paint. It is fascinating to be able to relate the rooms to the descriptions of contemporaries and to the inventories, but it is also interesting to have the reaction of the next generation, to whom many of the ideas on decoration and furnishing would have seemed out of date. François de la Rochefoucauld, who went to Houghton in 1778, wrote: “this magnificence, which has now passed out of fashion, has such an overwhelming effect, while I was compelled to admire it I should have preferred to be at a distance from it”. He was a Frenchman, but his reaction is comparable with those of other English visitors to contemporary houses. It is also interesting because it raises questions about the possible reaction of the 3rd Earl. Posterity has tended to follow Horace Walpole’s line that he was a hopeless figure as well as a vandal, but it is surprising to find references to pictures by Opie and Fuseli as well as Cipriani in the 1792 inventory. The first two artists suggest a certain individuality of choice, and it is possible that, quite apart from needing the money from the sale of the pictures, Lord Orford found the effect of the close hanging overbearing and wanted to achieve a lighter feeling in the state rooms (Fig 3). With the exception of the portrait of Catherine the Great over the chimneypiece, the big pictures now in the room are 20th-century arrivals there, the most recent one being a big group of Sir Robert Walpole and his family by Wootton. There is no record of it ever having been at Houghton, but when it came to light some years ago, the Cholmondeley family bought it as a tribute to their ancestor. Photographs: 1-3 by Country Life; 4-10 by Alex Starkey. All images are available to purchase from the Country Life Picture Library.